Fedora would like to hide menubar by default and replace it by browser button. To do it by clean way we need about:config preference to set system wide toolbar-menubar's autohide attribute (only for new profiles). Actually, what's keeping us from making it the default everywhere? We're going to make it default in Fedora...so +1 for default everywhere. > Actually, what's keeping us from making it the default everywhere? Keyboard accessibility. Linux doesn't show the menu bar when pressing Alt, you need to press Alt+[letter] without a hint what letter that might be. I believe F10 works, though, but that's not a widely known key among users. So if Alt key shows menubar in Linux we can make it default, right? Is the only blocker? There might be some drawback though. It works even When menubar is not hidden (ie. it popups File menu). I'm not sure if this is an error or desired behaviour. Please let me know if that's need to be fixed. > desired behaviour. Please let me know if that's need to be fixed. I suspect that desired behavior, but I don't know. Patch will make application button default on Linux and hides menubar for new profiles. It also ui.key.menuAccessKeyFocuses to true on Linux to allow access to menubar by Alt key. - do we really need an overlay to do this? - do we really want to do this now, given that Australis is around the corner? Does australis change the application button code? > Does australis change the application button code? Yes, Australis removes the application button completely in favour of a new menu button that appears at the end of the nav-bar (right-most end for LTR locales, left-most end for RTL). > > Does australis change the application button code? > locales, left-most end for RTL). In addition, all users regardless of menu-bar visibility will have the menu button available. Mike: With that said, is the menu-bar going to be hidden by default on Linux with Australis? I think fixing this bug might still be needed. > > > Does australis change the application button code? > > locales, left-most end for RTL). > with Australis? I think fixing this bug might still be needed. If this is what it looks like on Fedora by default, then yes, I think hiding the menubar by default (and showing the whole thing with a sole press of Alt) is the right call. That's way too much stuff at the top of the window. That's my position on the matter, anyhow. > - do we really need an overlay to do this? Even with the new Australis menu button, we'll need to make some changes here, so this bug should still get fixed. > here, so this bug should still get fixed. I don't see how this answers Gavin's question. The question is whether we should introduce the Firefox button to Linux users only to replace it with the panel menu thingy a few versions later. This patch is required also for Australis to hide menubar. Otherwise it is still visible when instance is started with new profile. Again, that wasn't the question. Anyway, I'll take this as agreement that this should wait for Australis. Attaching simpler patch without overlaying. >     <toolbar type="menubar" id="toolbar-menubar" class="chromeclass-menubar" customizable="true"
Please put these new lines inside the MENUBAR_CAN_AUTOHIDE ifdef (which, unlike XP_LINUX, depends on the toolkit). >@@ -3864,16 +3864,18 @@ pref("print.postscript.print_command", "
> // 1. The non-topmost panel steals focus from its parent window at showing. > // 2. The parent of non-topmost panel is not activated when the panel is hidden. > // So, we have no reasons we should use non-toplevel window for popup. 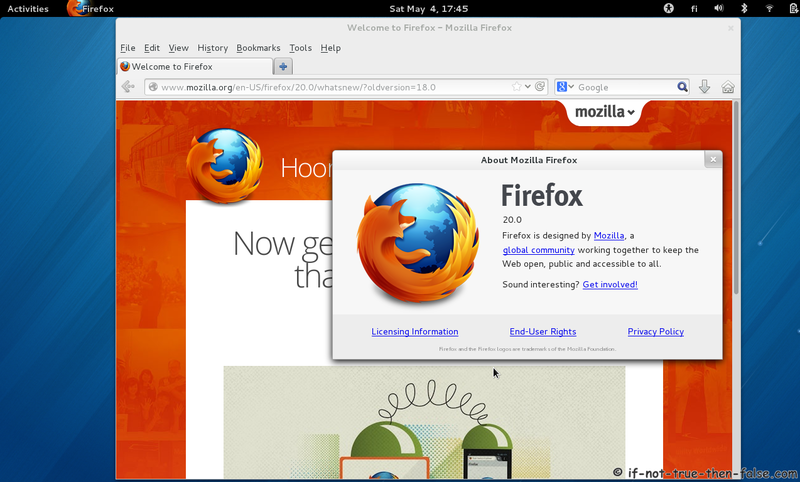 It seems like you'll need to update http://mxr.mozilla.org/mozilla-central/source/accessible/tests/mochitest/events/test_focus_general.html?force=1#99 and http://mxr.mozilla.org/mozilla-central/source/accessible/tests/mochitest/events/test_menu.xul#156. Thank you for fast review. Attaching patch addressing mentioned stuff. Dao, is this ready to land on UX? > Dao, is this ready to land on UX? But you don't use Gnome shell Application menu either.